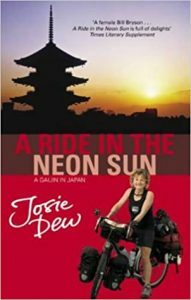 I selected A Ride in the Neon Sun: A Gaijin in Japan, by Josie Dew as my book for July for a number of reasons. Firstly, the idea appealed to me of a cycling book, even though it has been done already (February) and will be again in September. There’s something about a physical challenge that adds to the importance of highlighting female travel writers – it’s not just that they’ve got the brains to write, but the physical stamina to undertake arduous expeditions too (as if that should be in any doubt). There’s also something generally appealing about cycling as a mode of long distance travel and a subject to write about. It’s fast enough to cover good distances in a way that walking can’t, but slow enough to still interact with the world as you pass it (in a way that Rose Macaulay definitely didn’t in last month’s book). Secondly, Josie Dew came with a direct recommendation, as did most of my year’s reading list. She was recommended by Twitter contact Stephen McNally, and where I’ve had a name put to me I’ve generally tried to incorporate them. Josie Dew sprung to mind. 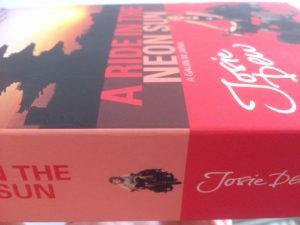 Published a series of cycling travel books, not sure if she’s still writing though. Thirdly, something about Japan appealed. Although Josie Dew has written a number of books, her account of her cycle through Japan stood out for me. It’s not a country I know much about, beyond the cliches, and I have never been. It’s also, in a sense, one of the most alien cultures to Europe – there are many similarities and deep connections, but in terms of its history, culture, language and attitudes it’s excitingly exotic and seemingly impenetrable. So I thought it would be good to cast myself away from familiar terrain and into the unknown. Written in the late 1990s, I did wonder whether the book would feel a bit dated. In a tech-rich country like Japan, society and culture can change very quickly, yet perhaps not to the extent that this would feel like an evocative trip into the past (in the way that last month’s trip to 1940s Spain was). I also wondered, when the paperback dropped through the letterbox (the Kindle version was ridiculously expensive), whether I’d actually get through it in the month. At over 600 pages, it’s a fair old doorstopper, and the sort of book you could probably use as quite an effective weapon. With the few days’ delay in its arrival and some time away when it won’t be practical to take it with me, I calculated that I’d need to read about 25 pages each sitting. That’s some commitment, but, well, on I go. I’m a few dozen pages in, and those 600 or so pages are feeling long and slow going. Dew is a good writer, but definitely one for providing a blow by blow, step by step account. She lingers on detail, and that might prove a great benefit later on when deep into Japan, but in the early stages it’s rather frustrating. I’m desperate for her to get beyond the planning and set up and get stuck into the groove of her journey. One review I saw online said that the book was too long and lacked the attention of a firm editor. Perhaps that’s true, and I’m certainly going into the reading with low expectations. But we shall see. I’ll report back at the end of the month… assuming I finish it.